Batters are listed on the score sheet according to the team batting order as shown on the score sheet below. 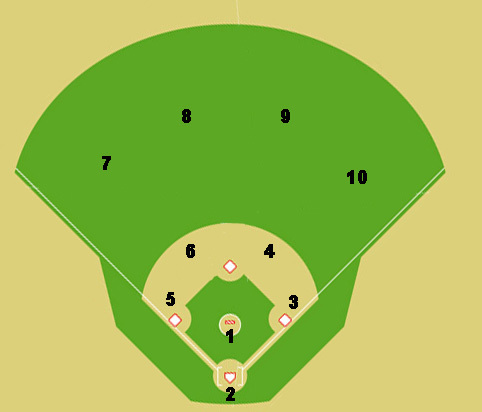 The number in the position column (POS) corresponds with the field position as shown in the baseball diamond diagram below. The following is a sample score sheet representing some basic scoring principles. With just a little understanding of how games are scored, one can easily recreate the entire game by merely following the sheet, batter by batter. Note: This sample sheet reflects the newer style score sheet which will become the norm for the 2008 season. The basic differences are a place to put the ball field name, game number, and scorer's name (bottom right). This info should be filled out on BOTH sides of the score sheet. The ball field name helps the journalist know which article to write. The game number will help us upload the sheets in order. The scorer's name will help the statistician know to whom he should direct any questions about the game. I like to place the letter H next to the home team on the home team side of the sheet and a letter V on the other side for the visiting team. The lead off batter in the first inning hits a single (1B). This is denoted on the sheet by a straight line from home plate to first base. The #2 batter hits a ground ball to the shortstop who throws to the second baseman covering second base, resulting in a force play of the runner going from first to second. This is denoted on the sheet by the numbers 6-4 (SS to 2B) and by a straight line from 1B to the halfway point between 1B and 2B and a small perpendicular line at the end. The small perpendicular line shows that the runner was put out at 2B (or somewhere between 1B and 2B). The batter on this play is given a fielder's choice (FC6). A FC is defined as an out made as a result of a fielder choosing to get an out at other than 1B. Note: A fielder's choice is given to the batter even though the batter might have been safe if the only play was to first base. As an example; with a runner on 1B, a batter gets a clean hit up the middle. The right center fielder is playing shallow. He fields the supposed base hit and throws to 2B in time to force out the runner who was on 1B. Even though the batter would have been safe at first if there wasn't anyone on base, the batter still receives a fielder's choice (FC) and not a hit as so many think. If a run should score as a result of a fielder's choice (FC), the batter does receive credit for an RBI (denoted by a 1 in the lower left corner). The result of the aforementioned play is 1 out (denoted by a circled #1) and a runner on 1B. The second batter hits line drive to the shortstop (LD6) and the third batter of the inning flies out to left field (F7). Zero runs were scored in the inning and zero is the team total for the game (0/0). The leadoff batter in the second inning hits a triple (3B). This WAS denoted by a straight line drawn from home to 1B, from 1B to 2B, and from 2B to 3B. It shows up now as a colored box because of what happens next in the inning. The next batter hits a fly ball to the right center fielder which is caught for the first out of the inning (denoted by a circled 1). The runner on 3B legally tags up and scores. This is denoted by a line drawn from 3B to home and a coloring in of the box that was formed as a result. The batter is given a sacrifice fly (SAC9) and a run batted in. The RBI is denoted as a 1 in the lower left corner. Result of the play; 1 run in, 1 out, nobody on base. The third batter of the inning (Batter #7) walks (BB, base on balls). This was denoted by a straight line drawn from home to 1B. The additional lines in this box are a result of what happens next in the inning. The fourth batter of the inning (Batter #8) also walks (BB). This WAS denoted by a straight line drawn from home to 1B. This forces the previous batter (Batter #7) to 2B which is denoted by a straight line drawn from 1B to 2B in Batter 7's box. Batter #9 comes to the plate with runners on 1B and 2B. He gets on base by hitting a ground ball to the third baseman who steps on 3B for the force out of the runner going from 2B to 3B. This is scored as a fielder's choice for the batter (FC5) and an unassisted put out of the runner going to 3B (Batter 7) by the third baseman (5U). The runner on 1B (Batter 8) moves to 2B (line drawn from 1B to 2B) and the batter is on 1B (line drawn from home to 1B). 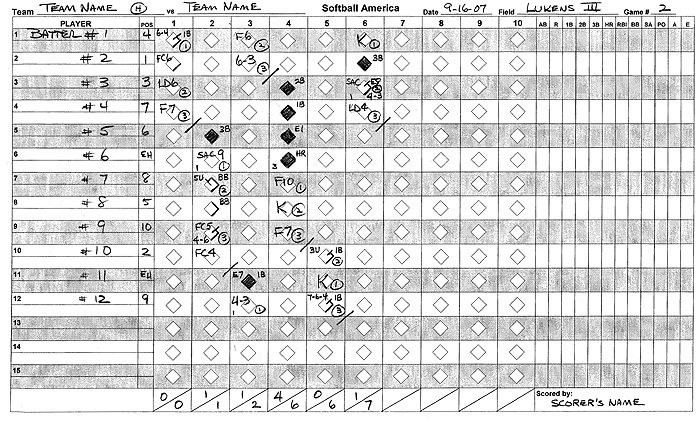 Result of the play; runners on 1B and 2B, 2 out (denoted by a circled #2 in the box of the runner (Batter 7). The next batter (Batter #10) hits a ground ball to the second baseman who flips to the shortstop for the final out of the inning. This is scored as a fielder's choice (FC4) for the batter. A half line is drawn (with a small perpedicular line) in the box of the runner going from 1B to 2B (Batter 9) to denote the out (4-6). The 3rd out is scored with a circled #3. Result of the inning; 1 run scored and 1 is now the team total for the game (1/1). 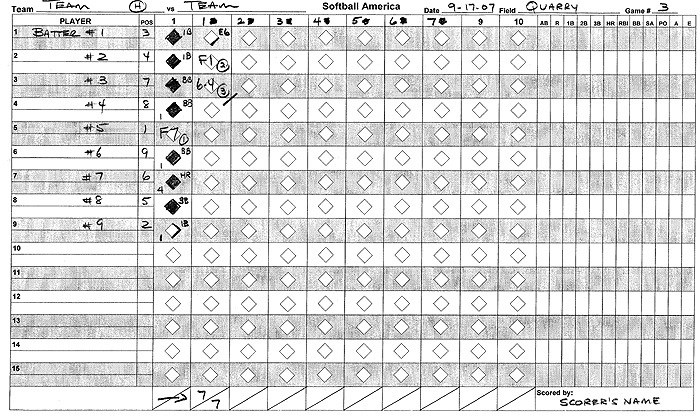 Note: Completed innings are denoted by a diagonal line drawn at the lower right corner of the last batter in the inning. This helps the scorer keep track from batter to batter, inning to inning. The leadoff batter in the third inning hits a single (1B) to left field. On the play, the left fielder misplays the ball (E7). This allows the runner to advance to third base. The next batter (Batter #12) hits a ground ball to the second baseman who throws to first (4-3) for the first out of the inning. On the 4-3 play, the runner on third scores. Batter #12 receives an RBI denoted by the #1 in the lower left corner. The next batter pops out to the shortstop (F6) and the following batter grounds out to the shortstop (6-3). Result of the inning; 1 run scored and 2 is now the team total for the game (1/2). The leadoff batter in the third inning hits a double (2B). The next batter (Batter #4) hits a single (1B). The runner on second base moves to third base. We know he does not score on the single because there is no RBI given to (Batter #4). Result; runners on first and third, nobody out. The next batter hits back to the pitcher who misplays the ball for an error (E1). As a result of the E1, the runner on third scores. Because the runner scores as a result of the E1, no RBI is given. Note: When a run scores as a result of an error, an RBI is NOT awarded to the batter. How can you tell that the run scored on the error and not the HR, you wonder? By looking at the next batter in the inning. Batter #6 hits a blast over the fence (HR). Had the runner on third scored on the HR, Batter #6 would have received 4 RBIs. The fact that he only received 3 RBI's (denoted by the 3 in the lower left corner) shows the runner on 3B scored on the E1. Batters 7, 8 and 9; fly out to right (F10), strike out (K), and fly out to left field (F7) respectively. Result of the inning; 4 runs scored and 6 is now the team total for the game (4/6). The lead off batter in the 5th inning hits a single (1B). The next batter swings and misses for strike 3 (K). The runner on first base leaves the bag on the swing and is called out. The play is scored as an unassisted put out (3U) by the fielder closest to base-- in this case the first baseman. Result of the play; 2 outs and nobody on base. The next batter (Batter #12) hits a single (1B) to left field and tries to stretch that single into a double. The throw from the left fielder hits the cutoff man (shortstop) who relays the throw to the second baseman for the tag out at second base. The left fielder and shortstop each get an assist on the play and the second baseman gets a put out. The play is scored 7-6-4. Result of the inning; 0 runs scored and 6 remains the team total for the game (4/6). The lead off batter in the 6th inning hits a 2nd foul ball for a strikeout (K) and the first out of the inning. Batter #2 hits a triple (3B). Batter #3 hits a deep fly ball to the left center fielder who misplays it for an error (E8) . The batter (Batter #3) gets on base and the runner on third scores as a result of the error. A sacrifice (SAC) and RBI are awarded to Batter #3 for the following reason; If, in the judgment of the scorekeeper the runner would have legally tagged up and scored if the outfielder had caught the ball, the batter is awarded a sacrifice and an RBI. Result of the play; runner on third scores, batter is on first with 1 out. The next batter hits a line drive to the second baseman for an out (LD4). On the hit the runner on first moves toward second and is way off the bag (without tagging) when the ball is caught. The second baseman then throws to first before the runner can get back for the double play (4-3). Result of the inning; 1 runs scored and 7 is now the team total for the game (4/6). Many times, a team with a short batting line-up will bat through the line-up in the same inning. In this case, continue in the column for the second inning by crossing out the 2 and placing a 1 in its place. Do the same for every succeeding inning as shown below. If all league scorekeepers could adhere to the scoring procedures as listed above, league statistics would be a lot easier to formulate. Games would be easier to write about. Stat-keeping in general would no doubt be a lot more consistent and accurate. If anyone has any questions or can add to this tutorial, please email or post. A simple once-over will give you additional understanding of how the game is scored. One question I ask our scorekeepers to ask themselves when confronted with a hit/error decision is, "Should the ball have been caught"? If the answer is yes, they should score it an error. If the answer is no, they should score it a hit. A few things are for certain, a 14 hopper that goes through the 2nd baseman's legs (touched or untouched) is not a hit - it's an error. A cleanly fielded grounder that is thrown over the 1st baseman's head into the parking lot is not a hit - it's an error. Reaching base because your infield dribbler resulted in a force out of a base runner at another base is not a hit - it's a fielders choice and you are charged with an at-bat (0-fer). A base hit to the outfield that goes through the right center fielders legs allowing you to circle the bases is not a home run, it's a single and a 3-base error. If the sample score sheet above is too small for you, click the link below for a larger pdf version.